Yes. This is a potato loaf. A lot of potatoes are in there. When I came across this recipe, I was puzzled how 50:50 potato and flour makes a loaf. But, here it is. It's soft, moist and more-ish. 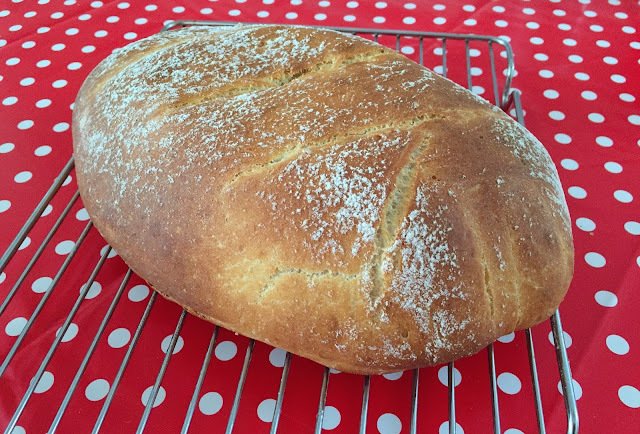 Although it's a bit of a fiddle to make this humble looking loaf, it's worth the effort. 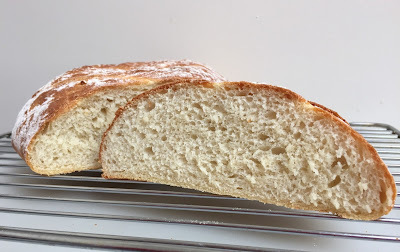 It has very distinctive texture different from any bread I have ever baked. The bouncy texture remains even a day after it is baked. Great with a bowl of soup. Place the potatoes in a large saucepan and cover with cold water, bring to the boil, then reduce the heat slightly and cook for 15–20 minutes until they are tender but not falling apart. Mash the potatoes with the oil in the saucepan until they’re as smooth as possible, then stir in the yeast mixture. Mix well with a wooden spoon and gradually add the flour and salt, a few tablespoons at a time, stirring well before adding more. Turn it out on to the work surface and knead the remaining flour into the dough. At this stage, the dough looks dry, do NOT be tempted to add more water otherwise the dough WILL become too sticky to work with. Knead the dough for 10 minutes until soft and pliable. Place it in a lightly oiled bowl, cover loosely with lightly oiled cling film and leave to rise in a warm place for 60-90 minutes, or until well-risen and spongy to touch. Knock back the dough with your knuckles and shape it into a rough ball. Flatten the ball on a floured surface, then bring the sides up to the middle to give a rustic surface to the bread. Sprinkle on some flour. Place it on a lightly oiled and floured baking sheet and leave to prove in a warm place for a further 30 minutes. Preheat the oven to 220°C/Fan 200°C Score the dough with a knife along the pinched join and sprinkle the top with the onion seeds. Bake the loaf in the centre of the oven for 35 minutes until well risen and crusty on top. Cool on a wire rack. 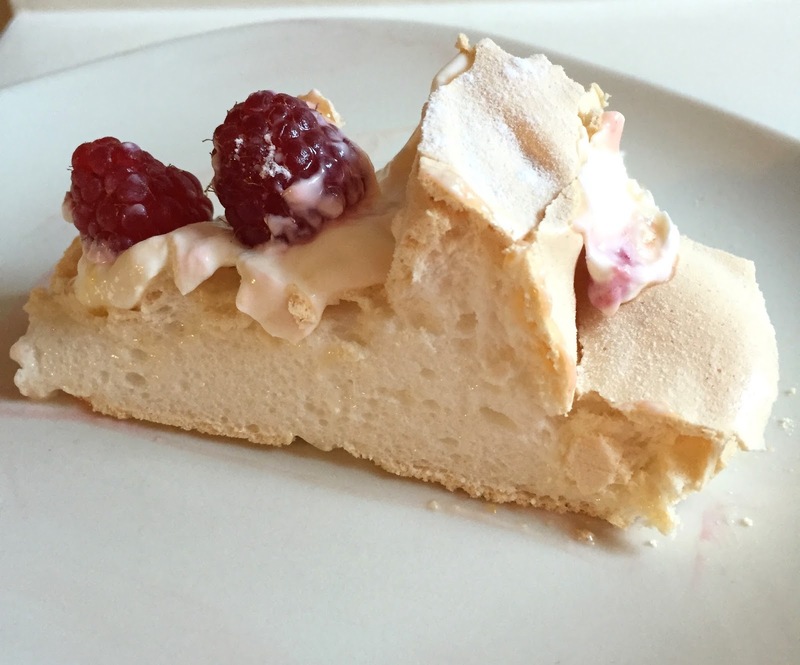 Previously on "Kyoto.B bakes", I baked a Pavlova using 4 egg whites. Obviously I had 4 egg yolks leftover. I could have made ice cream, mayonnaise, or custard, but in the end I decided to go with "crème brûlée tarts" which are basically posh custard tarts. As I used one egg yolk for the pastry dough, it was easier to work with than using no binding agent at all. And better still, the texture of the pastry melted in my mouth. So, there was no waste. I used all the leftover egg yolks. Job done. I could have made an authentic crème brûlée by sprinkling some sugar on top of the baked tarts and caramelising with a blowtorch. As I don't have such fancy equipment, I just sprinkled demerara sugar on them instead. Just the job. I know they are rather chunky looking tarts but I enjoyed the "shortbread" style pastry. Of course you can make them as elegant as you wish by making very thin pastry. Mix the flour, icing sugar and butter in a food processor until the mixture resembles fine breadcrumbs. Add egg yolk and water and process until the dough just comes together. Wrap in plastic wrap and place in the fridge for 30 minutes to rest. Preheat oven to 180ºC (fan oven). Grease the muffin baking tray. Roll the dough and cut 12 round thin discs. Place them in the muffin baking tray. Cover the pastry bases with non-stick baking paper. Fill with baking beans. Bake for 10 minutes. Remove the paper and baking beans. Bake for 6 minutes or until golden. Reduce temperature to 140ºC (fan oven). Bring the cream to a simmer in a small saucepan over low heat. Remove from heat. Whisk the egg, sugar, vanilla bean paste and extra egg yolks in a heatproof bowl. Gradually whisk in the cream until combined. Pour the custard mixture into the pastry cases. Bake for 20 minutes or until just set. Sprinkle the tarts with demerara sugar. Set aside to cool completely.